What’s your Haribo memory? Whether you used to share your sweeties with your best friend or whether you rather enjoyed them by yourself – gummy bears and gummies in all shapes and forms are part of the fabric of our childhood. Time for triple berry homemade gummies, guys! 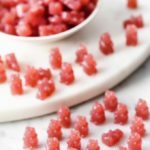 These fruity little guys are a wonderful combination of fresh berry juice and grass-fed gelatin. 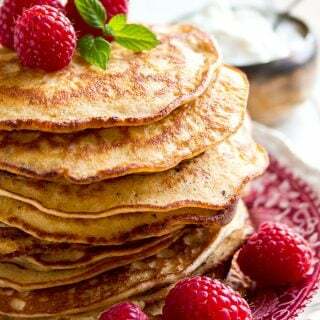 Strawberries, raspberries and blackberries are all low in carbs and keto-friendly. Good quality grass-fed gelatin has LOADS of healthful properties thanks to the collagen it contains, from improving your gut health to radiant skin. Do not confuse grass-fed gelatin with Jello, which is full of artificial additives. Read more about the benefits of gelatin here. 1.) Place the gelatin into a bowl. Add the water and allow to bloom. 2.) 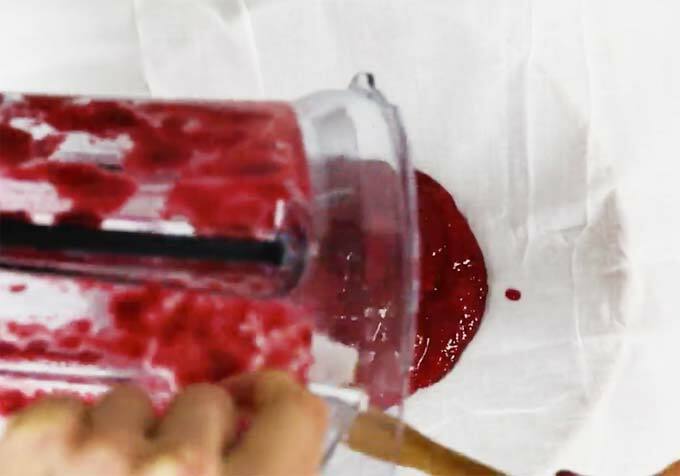 Mix strawberries, raspberries and blackberries in a high speed blender until smooth. Tip: If you don’t have a high speed blender, you could use the attachment of a stick blender. 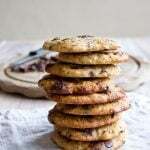 You may have to do this in several batches, but this will yield the same smooth result. 3.) Pour the berry mix onto a muslin cloth which you have placed over a bowl. Muslin cloths are quite useful in the kitchen, I have this one. I also use it to squeeze liquid out of steamed cauliflower and courgette when I make fritters and to make labneh (yoghurt cheese) – yum. 4.) Gather the cloth together and squeeeeze all the berry juice out. Discard the pith. 5.) Warm half the juice in a pan on a low heat, until it starts to bubble. Add the gelatin and stir until combined. 6.) Pour the mix into a jug and add the second half of the berry juice. Stir. The reason for heating only half the juice is that it loses its vibrant colour when warmed. 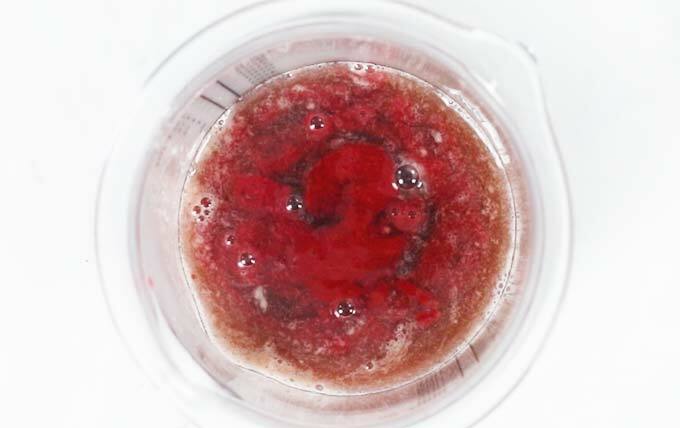 Can you see how the cold juice in the middle of the jug is much redder than the rest? We want our sugar free gummies to be as colourful as possible! 7.) Using a pipette, fill each cavity with the berry-gelatin mix. Then cool in the fridge for 2 hours until set. 8. 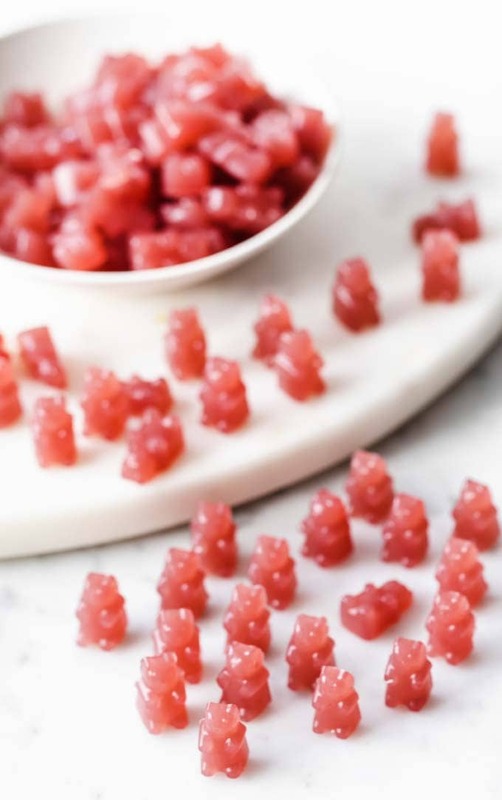 Release your fruity homemade gummy bears from the mould and enjoy! Personally, I think these gummies don’t need any extra sweetness. They don’t taste like Haribo, they’re so much better. 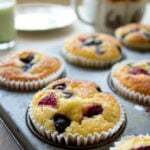 They’re fruity, slightly zingy and just little bursts of goodness. 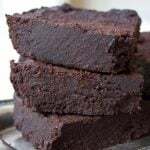 If you have more of a sweet tooth than me, do feel free to add 1-2 tsp of powdered erythritol or 4 drops of liquid stevia when you add the gelatin to the warmed berry juice. The ripeness and quality of your berries will have a huge impact on how fruity and how sweet the end result is. Fresh berries will always taste better than previously frozen berries. Get creative and experiment with ratio of different berries too. It changes the colour. For example, if you want more of a purple gummy bear, add more blackberries and less raspberries. 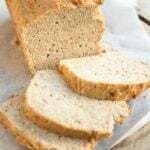 Just be mindful this will alter the net carb content slightly. 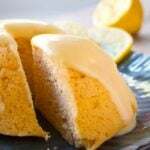 You can also add other pairing flavours like lemon, lime or vanilla and cinnamon. One benefit of adding lemon or lime is that the acid in either will extend the shelf life of your gummies – it prevents the growth of bacteria. Move over, Haribo! 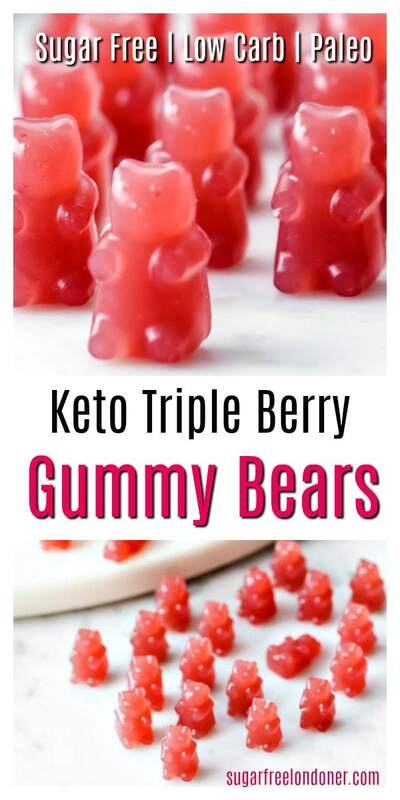 These homemade Keto gummy bears are a super healthy sugar free treat. The whole family will love these little guys! Low carb and Paleo. [Place the gelatin into a bowl. 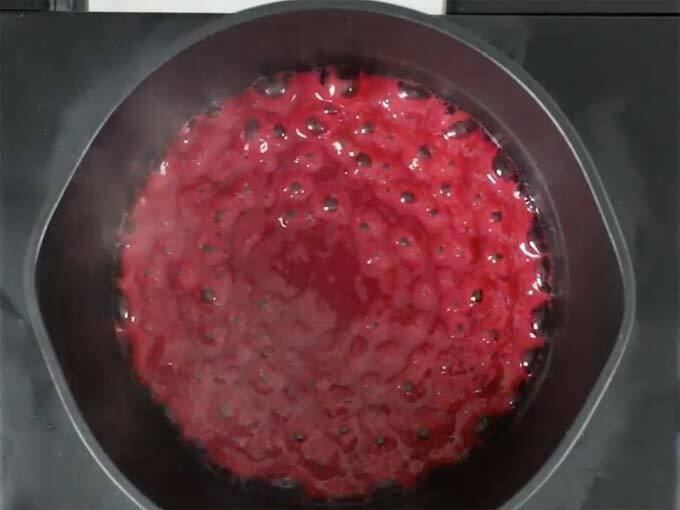 Add the water and allow to bloom whilst you make the berry juice. 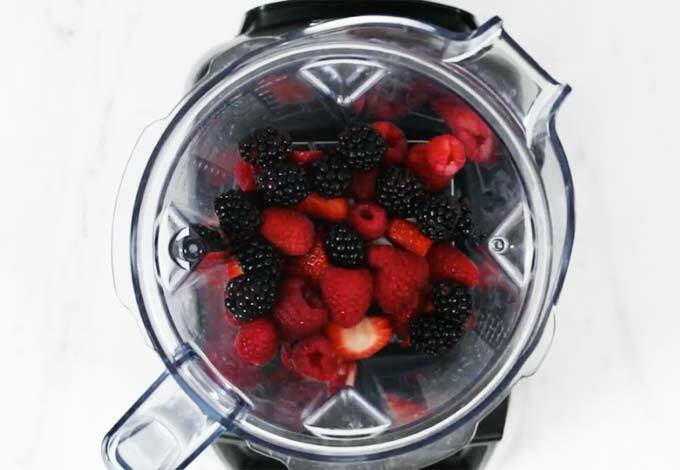 Add the strawberries, raspberries and blackberries to a high speed blender and blitz until smooth. Pour into a muslin cloth and squeeze out the juice. Discard the pith. Pour half the juice into a pan and warm on a low heat. Add the bloomed gelatin and mix until it dissolves. Remove from the heat and add the rest of the juice. (Adding the juice in two parts ensures the gummy bears keep their colour.) Skim off any foam with a spoon. (TASTE the mix at this point. 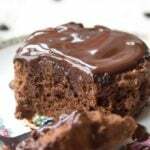 If you feel it needs a bit of extra sweetness, stir in 1-2 tsp of powdered erythritol). 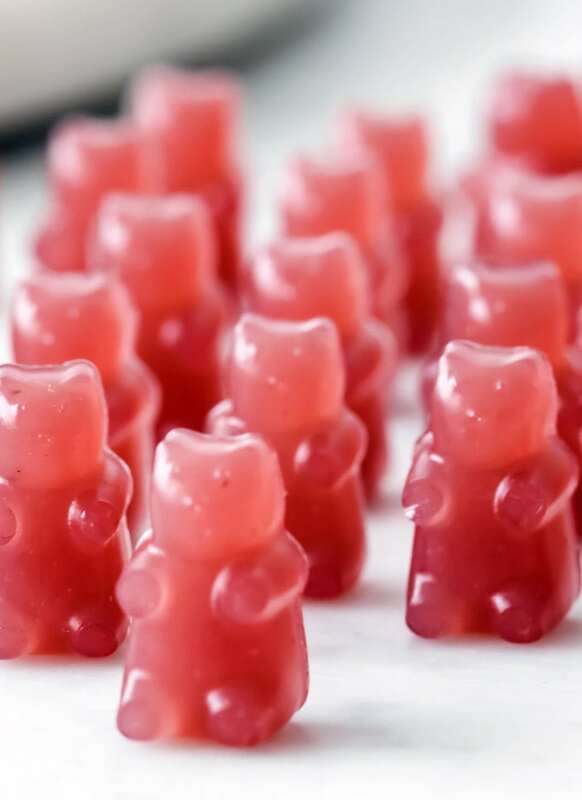 Place your silicone jelly mould onto a flat surface and carefully add the triple berry gelatin juice to each gummy bear using a pipette. 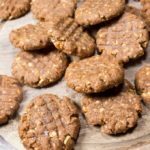 I calculated the nutrition on the basis of 15 portions. My gummy bear molds yielded 150 cute little bears - 10 per portion - but the amount of bears will depend on your moulds. You can store your homemade gummies in the fridge for up to 3 days. We liked these gummies sweetener-free. The sweetness of the gummies will depend on the ripeness and quality of your fruit. Simply add some powdered erythritol if you feel the gummy bear juice needs it. I’ve tried something similar before and the texture came out very much like Jello and not more firm like actual gummies. 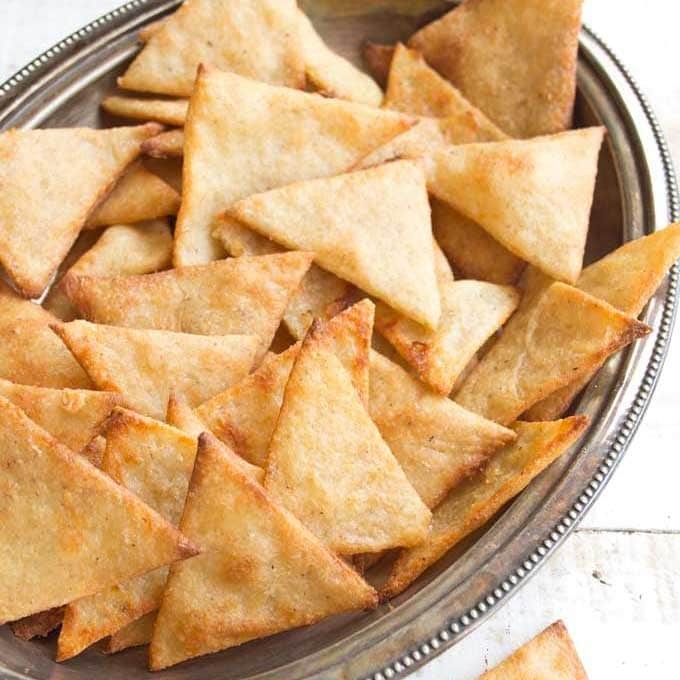 What is the texture like on these? I think they are just like gummies, quite firm! Question, bloom, what is this? I added the gelatin to the berry and water mix on the stove but found it clumps up, I was thinking on the next batch that I use a mixer. Advice? Great idea on color, I will have to try. I dont add much sugar either if any. I do leave the fiber in tough-healthier that way. 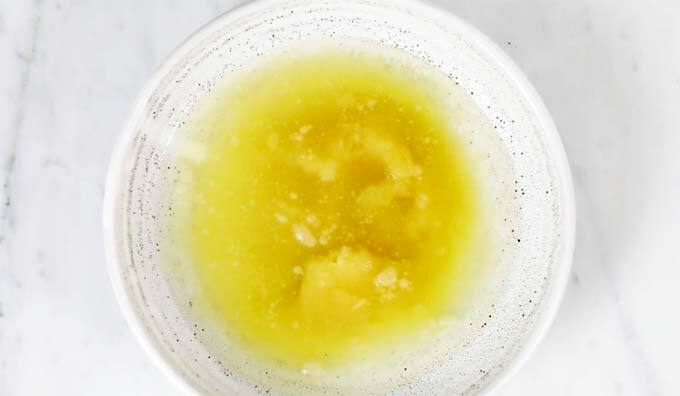 You dissolve the gelatin in water for a few minutes. This is the “blooming” step described in the recipe. It ensures that the gelatin does not clump. I hope this helps!! 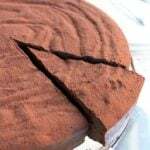 I don’t recommend it – I haven’t tried with this recipe, but from previous experience it changes the texture. 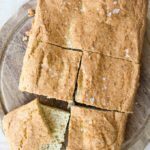 any tried making this recipe with Knox gelatin? it is easily available in Walmart? Can i use frozen berries? Hi, any gelatin works, though there are differences in quality – that’s why the recipe states grass-fed gelatin. As for the berries, I recommend you use fresh berries if you can. They just taste better. How cute!! Do you remember how much juice you got out of the berries all together? These look great! If I put them in a jar or container do they stick together?